Radical Advocate, and Journal of Reform. 1/1, 1853-1858. $2.00 a year. 4 pp., 13 x 20, 16 x 21. In its last two years, this seems to have been called the Spiritualist. U. Clark's Spiritualist Register for 1858, lists it as existing at that time and says the journal "wields heavy blows in favor of the Harmonial Philosophy," and the journal, while giving attention to the phenomenal side of spiritualism, was more fundamentally an exponent of the man-is-a-spirit side of the movement, exemplified by A.J. Davis,A.-L. Cahagnet, Catherine Crowe, Justinus Kerner, et al., all of whose works were featured. Contributions by Isaac Post, S.J. Finney, J.B. Ferguson. 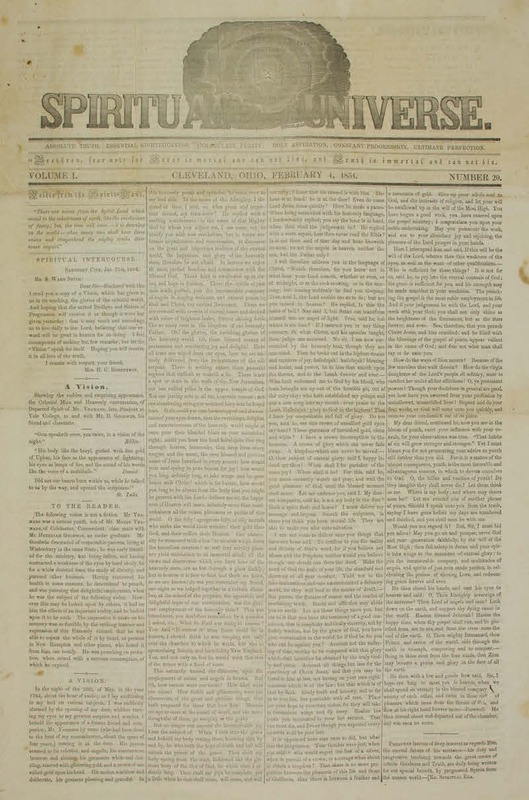 The reform side of the journal was exemplified in its prospectus: "This paper will seek as its end, the transformation of the selfish desires, and isolated interests of mankind, to holy aspirations and Harmonious Unity." The journal may be the predecessor of The Spiritualist, noted as being published in Cleveland by Everett in 1857. Everett may have become disillusioned with spiritualism in general in 1858,and certainly was disillusioned with the phenomena produced by John Koons in his Spirit Room in Athens County, Ohio. As Everett reported in the journal, during a seance at his house with Koons at which the spirit John King played music, flashed lights, and touched the participants, one of those attending struck a match and caught Koons and his daughter in flagrante delicto. Wisconsin Historical Society, University of Rochester, Indiana University, State Library of Pennsylvania.